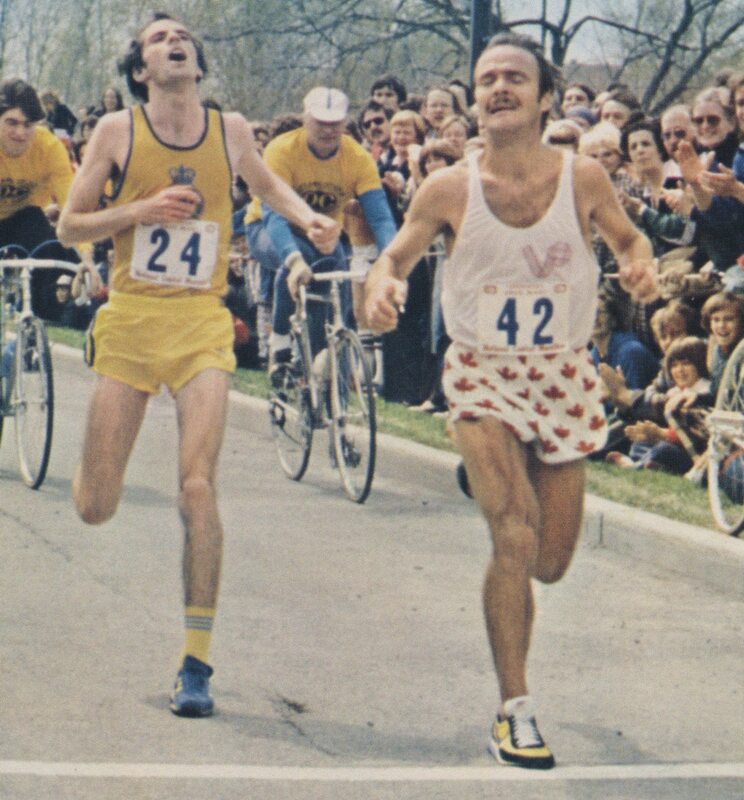 In 1975, 159 people laced up their sneakers and set off from the Carleton University campus on a gruelling 42-kilometre jog that eventually becomes the biggest sporting event in the city. 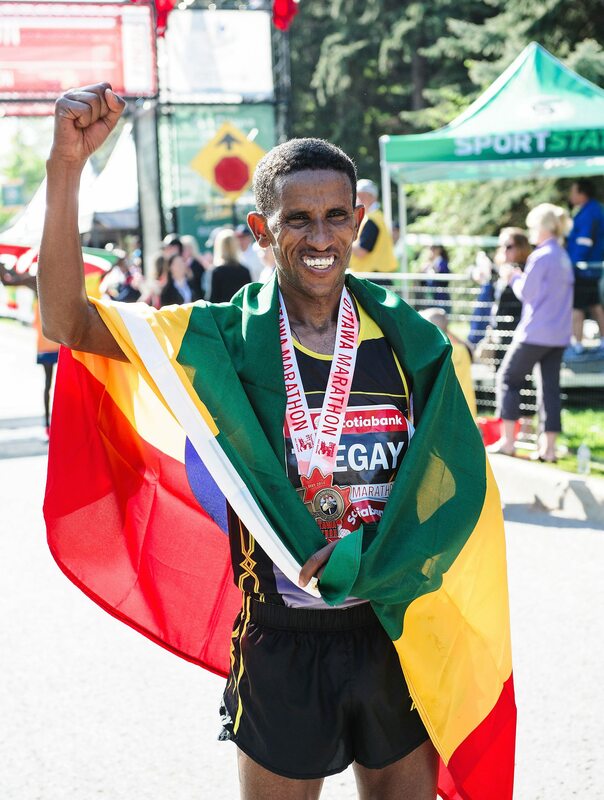 As Ottawa prepares for this weekend’s races, here’s a look back on one of the largest running events in Canada. Bill Williams sits next to Don Johnson of Carleton University’s Sport Medicine Clinic, on a flight from Boston. Both men have run the marathon there. Both dream of a hometown marathon in Ottawa. Two years later, the city agrees to make a marathon part of the Tulip Festival. Ottawa is chosen as the Olympic trials location just weeks ahead of the Montreal Games. 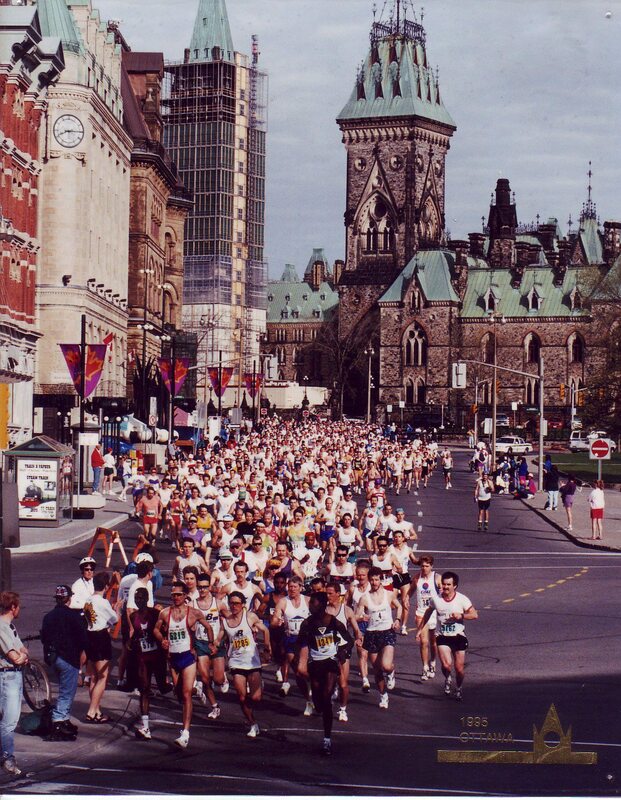 Ottawa is a “runner’s paradise” according to Hal Higdon, who raves about the marathon in Runner’s World magazine. 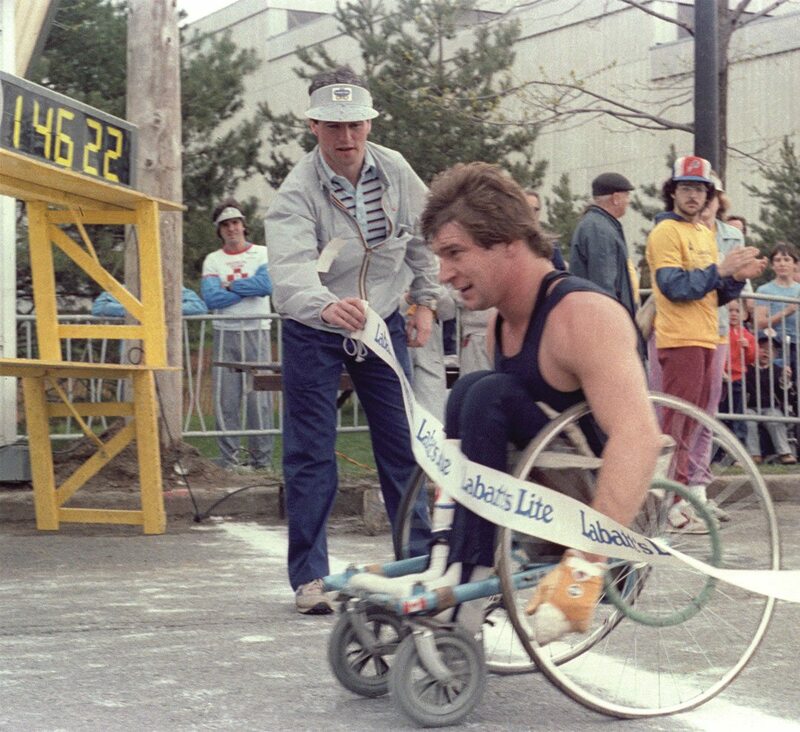 Rick Hansen is the first wheelchair athlete to compete. And when the category is added, he is the first official winner. The marathon won’t draw this many runners again until 2010. Rick Hansen. Courtesy of Ottawa Run. Silvia Ruegger wins the women’s race and the right to represent Canada at the first women’s Olympic marathon in Los Angeles, where she places eighth. 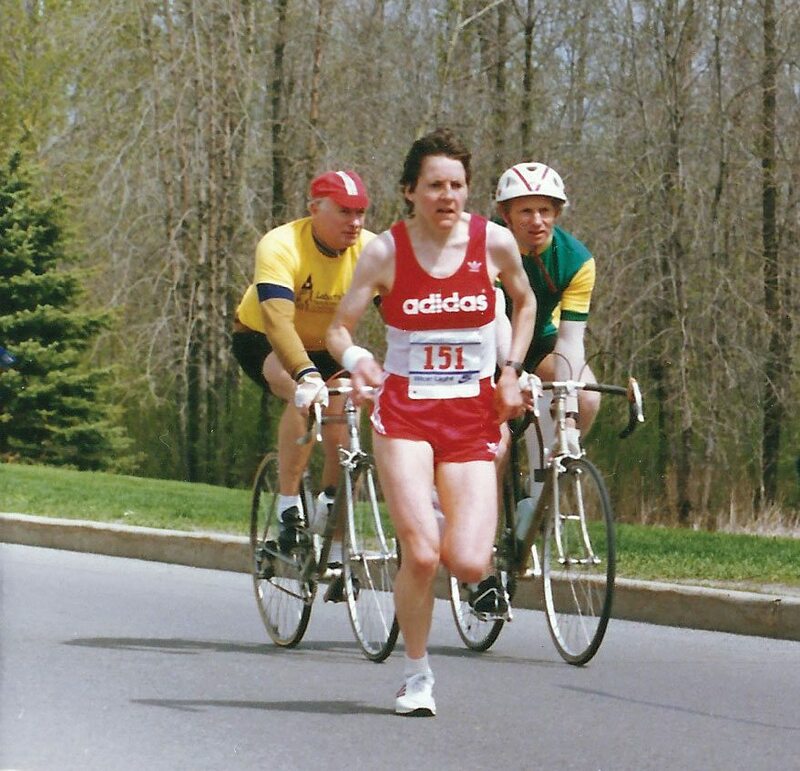 She will hold the Canada women’s marathon record (2:28:36) from 1985 to 2013. Unable to secure liability insurance or a sponsor, the marathon is cancelled — then, at the 11th hour, it is reinstated. A 10K race is added to bolster flagging registration. As the first running wave abates, marathon participation dips below 1,000 for the first time since 1977. It bottoms out in 1995, when only 571 runners lace up for the marathon. An 8K inline skating race is added. It will grow to become a marathon-length event, and the need for a smooth surface will create some headaches for event organizers. While never as popular as running, inline skating remains part of the race weekend until 2005. Snow, single-digit temperatures, and 25 km/hr winds give runners extra bragging rights. New race director Jim Robinson promises to attract thousands of runners to Ottawa once again. The second running wave will help Robinson make good. Ottawa becomes the first marathon in Canada to use microchips to record individual times. Ottawa company Sportstats will become the biggest sport-timing company in North America. Malcolm Campbell achieves the dubious distinction of the marathon’s slowest men’s win (2:31:16). Amos Tirop of Kenya crosses the finish line first, but Abderrahime Bouramdane of Morocco wins after 14 runners are misdirected on a 400-metre shortcut. Runners enjoy dramatic photos of their run framed by a new archway in Ottawa’s Chinatown neighbourhood. It is part of a long-range plan to make the marathon route a showcase of Ottawa. But road closures and the need to balance elevation changes on the course mean the marathon won’t pass under the archway again.